12 OCT 29 on horiz. 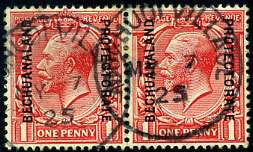 pair GB ovp'd KGV 1d (SG.92). 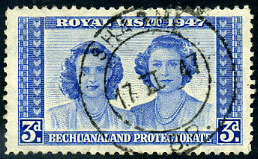 17 XI 47 on KG6 3d Royal Visit (SG.134). 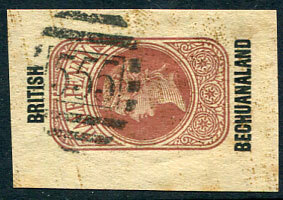 A/NO 17 90 on QV 2d (SG.11). 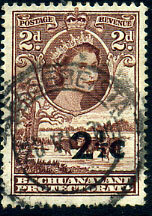 27 IV 65 on QE2 1c (SG.168). 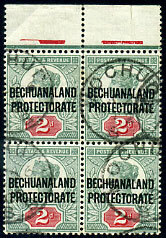 without dates inserted on GB ovp'd QV ½d newswrapper cut-out piece. 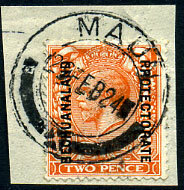 (D2) 6 IV 62 on QE2 2½c (SG.170) piece. (D2) 30 III 66 on horiz. 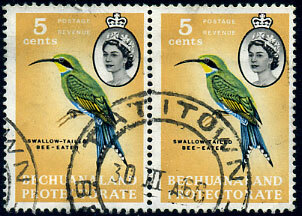 pair QE2 5c (SG.172). 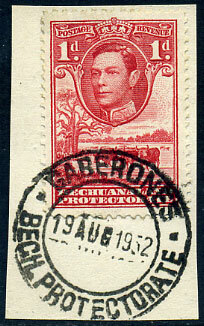 (D3) A/3 FE 35 on KGV 1d (SG.100). (D6) 20 VI 61 on QE2 2½c on 2d (SG.159). 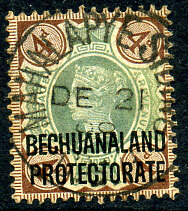 (D5-2) dated 14 JU 2(4?) 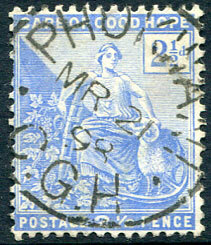 on GB ovp'd KGV 2d (SG.77) piece. 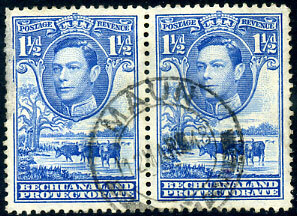 (D2) 29 FEB 24 (ERD) on GB ovp'd KGV 2d (SG.77) piece. 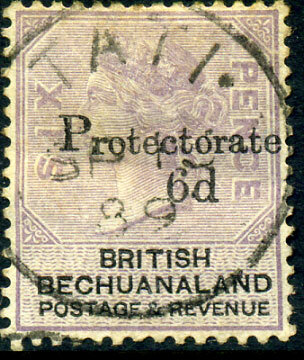 (D2) in purple dated 7 JL 08 on GB ovp'd KE7 1d (SG.68). 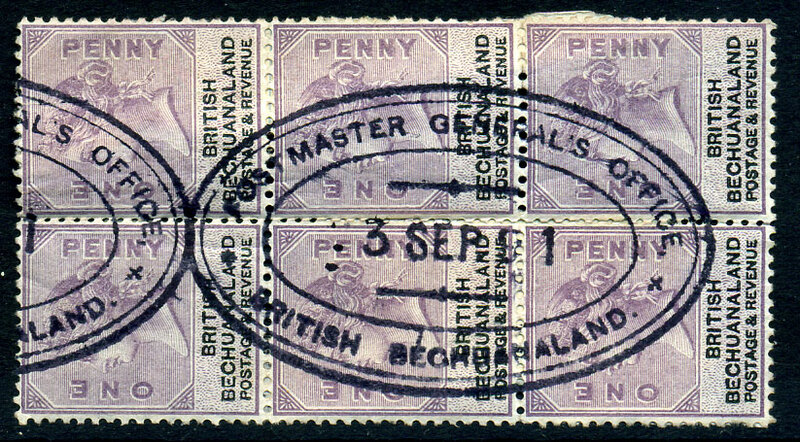 (D3) 23 NOV 16 on GB ovp'd KGV 1d (SG.74) piece. 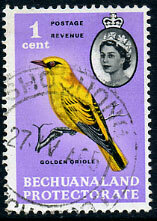 (D2) 22 XI 63 on QE2 2½c (SG.170), thinned perf. 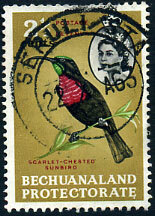 defect at top. 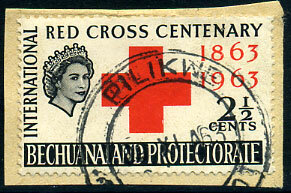 (D2) 26 X 63 on QE2 2½c Red Cross (SG.183). 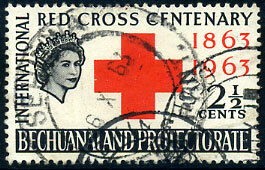 (D2) 29 XI 63 on QE2 2½c Red Cross (SG.183) piece. 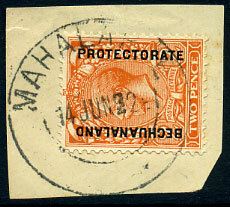 (D2) 23 MAR 34 on horiz. 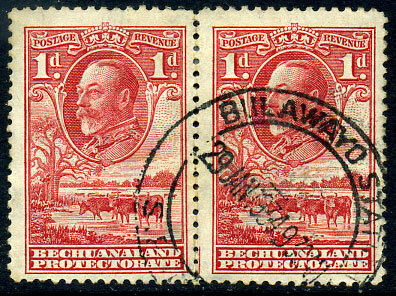 pair KGV 1d (SG.100) piece. 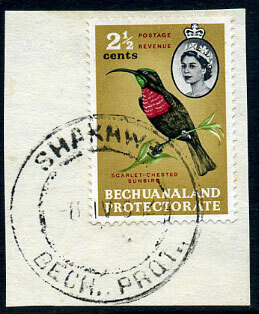 (D2) 12 MAR 48 on horiz. pair KG6 1½d (SG.120a), surface faults left edge. 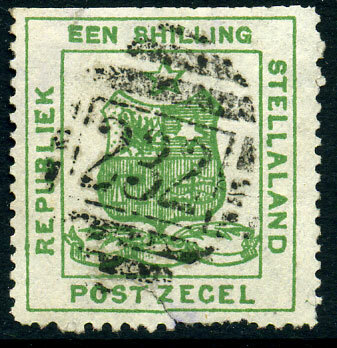 (D3) 9 MAY 47 on horiz. 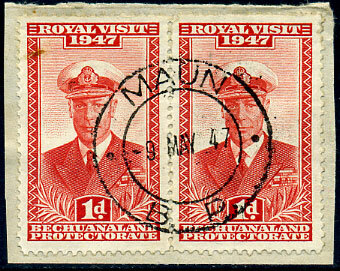 pair KG6 1d Royal Visit (SG.132) pair. (CDS) dated MR 31 01 on horiz. 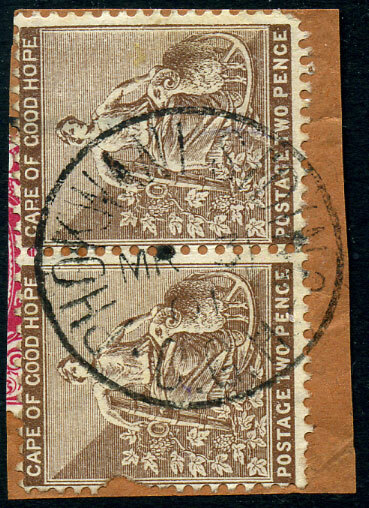 pair CGH 2d (SG.50a) piece, left stamp with defect, piece missing, at left. MY 7 25 on horiz. 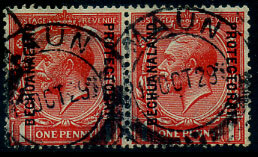 pair GB ovp'd KGV 1d Simple Cypher wmk (SG.74a). 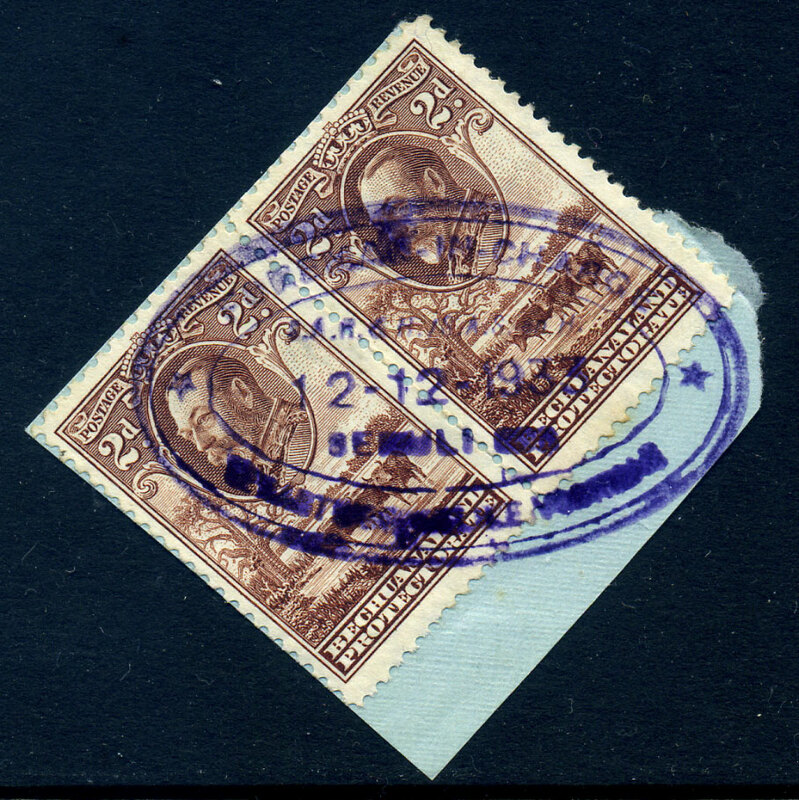 newly discovered purple ink TRD-like d/ring oval dated 12-12-1933 on horiz. 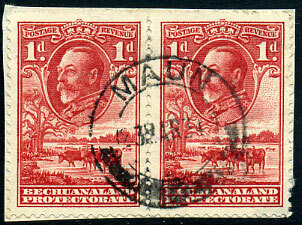 pair KGV 2d (SG.101) piece. dated sideways top to left 2/AP 9 96 on horiz. 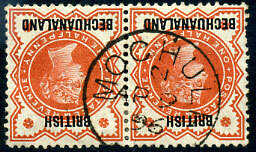 pair GB ovp'd QV ½d (SG.9). on CGH ovp'd 2d (SG.6). 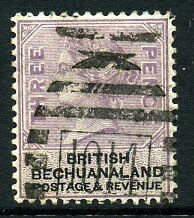 in purple dated JU 17 10 on GB ovp'd QV 2d (SG.62). on GB ovp'd QV 4d (SG.64). 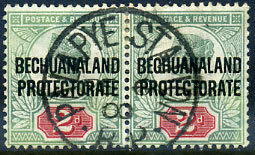 DE 21 98 on GB ovp'd QV 4d (SG.64). previously unrecorded d/ring oval in purplish-black dated 3 SEP 91 on block of six (2x3) QV 1d (SG.10). 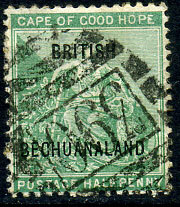 on CGH ovp'd ½d 10½mm apart (SG.58). 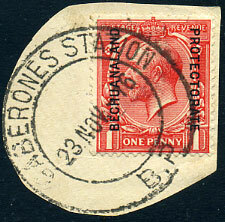 dated AP 30 94 on GB ovp'd QV 2d (SG.34), rare office. 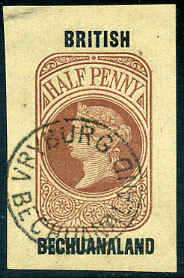 on GB QV ovp'd 4d (SG.35) showing distinctive broken "T" in BRITISH.